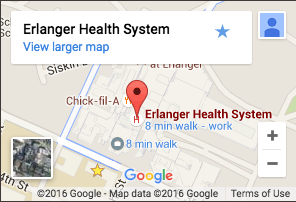 Designed for adults aged 60 and older, the Senior’s Program at Erlanger North Campus is an inpatient program focusing on diagnosing and treating the mental health issues and complex problems associated with aging. The goal of the program is to preserve the dignity and maximize the functionality of each individual, helping them cope with stressful issues such as grief, loneliness, illness and disability, changing roles and status and family conflicts. Patient may be experiencing depression, anxiety, psychosis, and behavioral changes related to dementia. The program accepts referrals from many sources: physicians, social service agencies, assisted living facilities, nursing homes, family members and self referrals. An interview with the patient, family member and referring health professional helps determine if the individual meets the criteria for the program and the program meets the patient’s needs. When other care alternatives are more appropriate, helpful information and referral services are provided. A comprehensive evaluation of the patient’s emotional, mental and physical condition is the basis for the treatment plan. In a meeting with the patient and the family, the treatment professionals communicate the results of the evaluation and review treatment choices. Care is provided utilizing a multidisciplinary approach. A typical patient stay is a week to ten days. A program of medication, structured activities, counseling and other methods may be used to prepare the patient for discharge from the hospital. For some patients, the goal is stabilization so that they can return to their home. For others, their inpatient stay may be a transition to a new lifestyle, perhaps moving from living alone to an environment that can better meet their needs. Whatever the individual circumstances, the program is designed to work closely with the entire family in charting a course of treatment and recommending after-care. The team is supported by a Board Certified Internist, Nutritionist, Pharmacist, and as needed, an Occupational and Physical Therapist. To schedule an appointment for an assessment, call the Seniors Program Monday-Friday 9:00am- 5:00pm at 423-778-3434. At other times, please contact the patient’s primary care physician for further direction. If there are any questions, please feel free to call the Seniors Program 24/7.